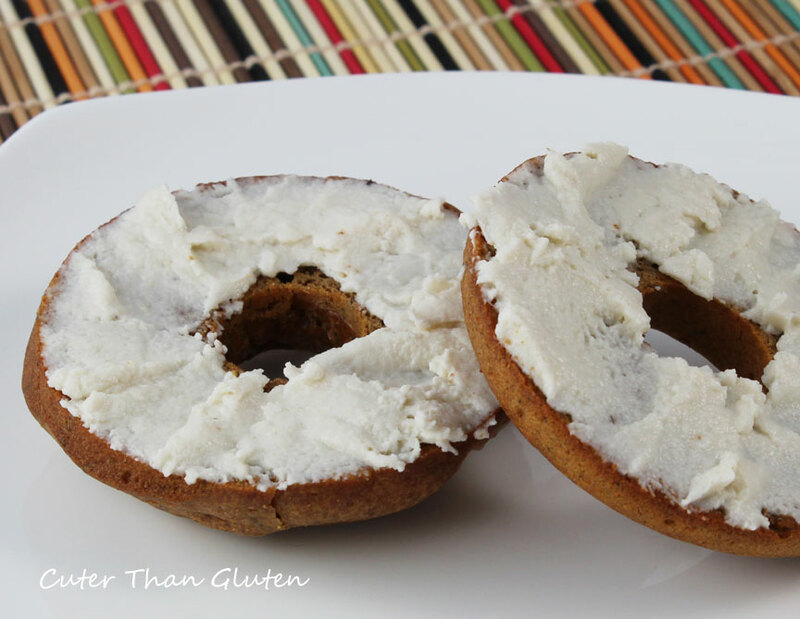 What could be more perfect than bagels with cream cheese? 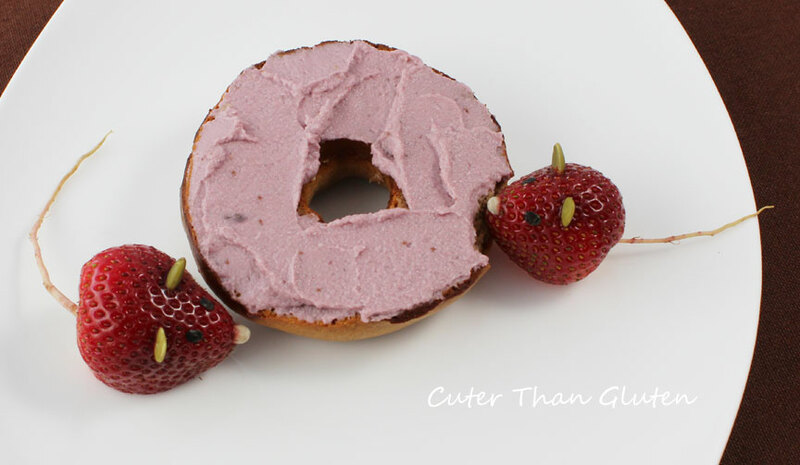 I have two bagel recipes in my cookbook, but I am also posting a new bagel recipe next week here on Cuter Than Gluten. 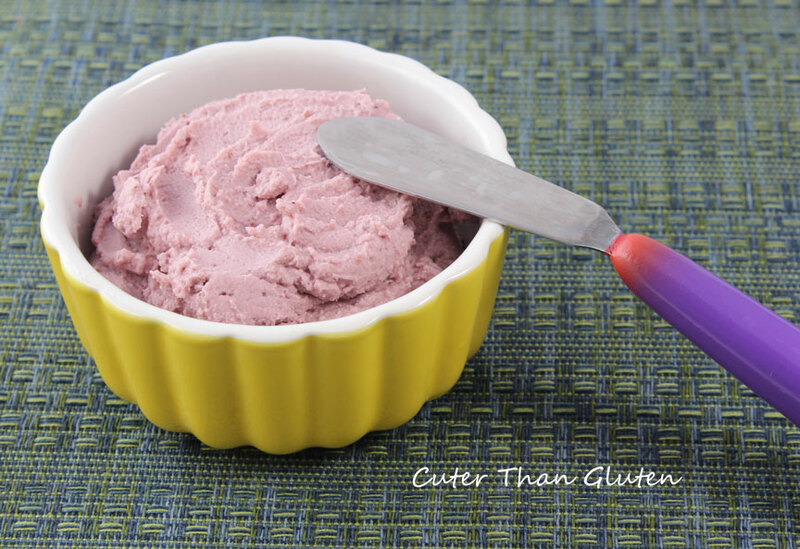 This cream cheese is creamy and delicious and I made a strawberry version! I can’t explain why the strawberry version is sort of lavender instead of pink (hard to tell in the photo). Hmm… cooking chemistry is not my point of expertise. Anyway, I like purple. I am sure this could lead to some tasty frosting too. I would add the sweetener during the cooking faze if you decide to try it. Later I will experiment and write a recipe for that if it works out. I saw these cute strawberry mice made with candy features on a preschool handout and I decided to improvise with what I had on hand. I gave them pumpkin seed ears, a sunflower nose, nori paper eyes, and radish root tails. The tails bother me a bit. They border on creepy. Maybe next time a parsley stem or something less “bare” looking. Blend the cashews in a good blender or food processor until finely ground/powdery. Add the salt. In a large sauce pan bring the water to a boil and add the agar agar. Whisk until dissolved (2 minutes or so). Slowly stir in the coconut milk and bring to a boil (whisking all the while). Pour the mixture into the blender, add the vinegar, jam (if using), and honey. Blend until very smooth (use caution blending hot liquids). Pour the contents into a glass storage container and chill in the refrigerator for several hours until firm. The cream cheese can be used in this solid form, but I like it best when whipped. So, I drop it into the food processor and process until very smooth. 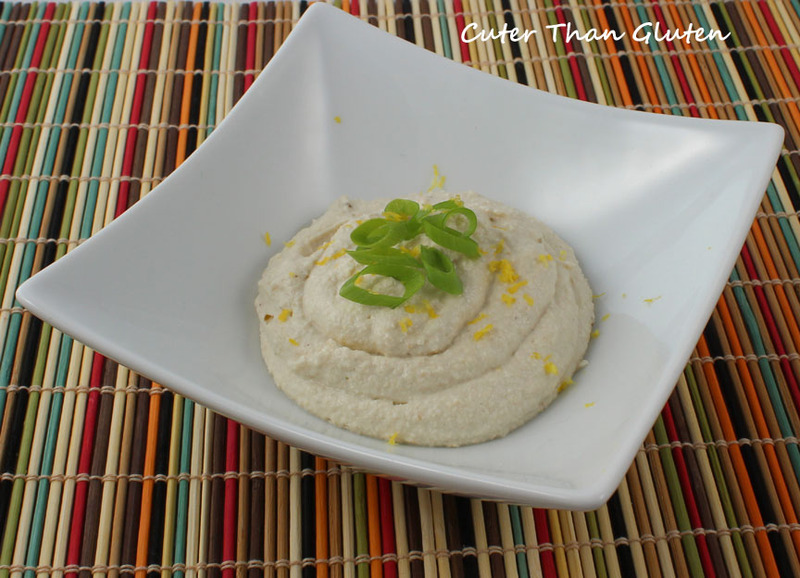 I am sharing this recipe on … and love it too! for strawberry month. Yum! Also on Allergy Free Wednesdays. While on vacation, I acquired a new cookbook, a beautiful bowl of soup, and I found several fun recipes to try (no caps on the title- their quirk not my mistake). 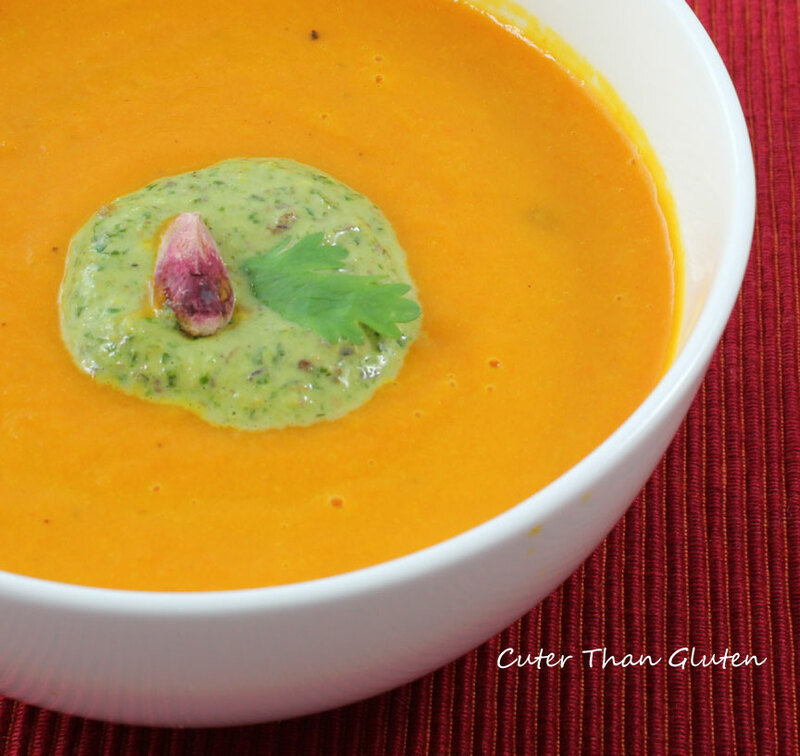 So far my favorite recipe is the curried carrot soup with cilantro-pistachio cream (really this book uses no caps on titles– a very lovely book actually). If you decide to make this at home you can; buy the cookbook, or make any nice carrot soup recipe (they’re out there). I made my own curry mix because I avoid nightshades and I omitted the dairy in the recipe– it came out great. But, to the point: Cilantro-Pistachio Cream. This is my new favorite condiment. 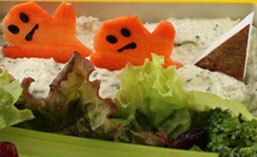 It makes a delicious salad dressing, soup topping, vegetable dip, etc, and the recipe follows the next photo. 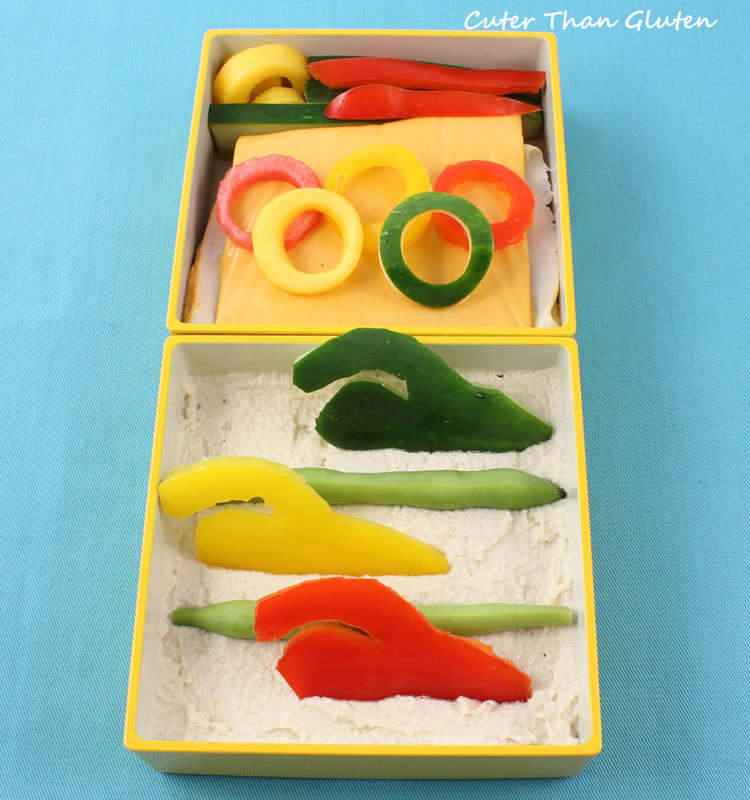 My daughter loves it too, so I kept the bento simple. 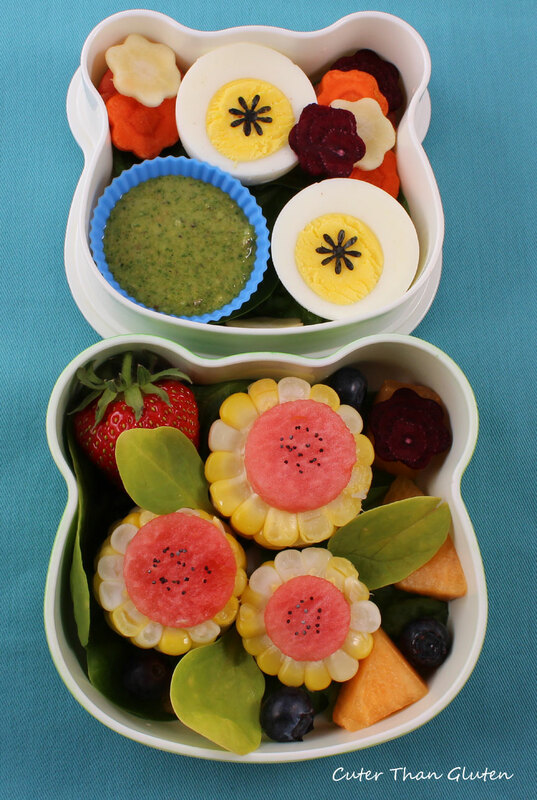 Corn on the cob with water melon tops, boiled eggs, and raw carrot and beet flowers. Of course the star; Cilantro-Pistachio Cream to dip the vegetables and to smear on the corn. I have no idea how she ate the corn because her four front bottom teeth have barely grown in and the top fronts are loose. She said she managed. Combine the cilantro, pistachios, and garlic in a small food processor. Pulse until it is a thick paste, then add the pepper and coconut milk. At this point I like to enjoy the cream with a slightly course texture, but you could process it until smooth as the book suggests.